There’s something particularly earth-shattering and primal about duelling basses: the driving, grinding, earthy experience of digging into dirt and finding treasure. With two bass-players and Led Bib bandleader Mark Holub on drums, this quartet’s debut was always going to be a groove fest. 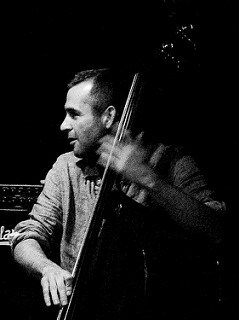 Liran Donin is the shoulder-popping neck-thwacking double-stopping badass bass-man from Led Beb, and Tom Herbert is the fulsome fearsome engine of Polar Bear. It’s an inspired pairing of bass-players, and an inspired pairing of rhythm section and lead player in trumpeter Chris Batchelor. Batchelor lends a composer’s ear and a lot of bop to the open playing. He’s so melodic, they’re so driving. It leaves a certain onus on Batchelor, who responds with a warmly lyrical approach and a diverse selection of horns: trumpet, specialised cornets, and a horn of seven horns that looks like the eponymous throne from Game of Thrones: a beast of seven pipes attached to a man. We know the set has reached serious business when he whips it off the piano half an hour in. It blasts like a car horn. It’s pleasing to find Chris Batchelor extemporising melodic motifs that are taken up by the other players. He settles on a good one, and Tom Herbert echoes it. There’s that great feeling when you perceive players ‘feeling each other up’ and we’re part of it, vicariously. Pervy, nerdy fun for musos, though maybe less appealing to those who prefer their music pre-prepared and ready to eat. We, however.. don’t we like to see ‘em cookin’. Writing about free playing isn’t like the cliché ‘dancing about architecture’. It’s more like architecture about dancing: finding the structural form among the baggy content. We do this intuitively as listeners, forming patterns and applying our own structures and references which are the basis of the sensibility we use to apprehend what Kevin LeGendre calls “the island of meaning in the ocean of music”. It’s funny how the shape of a ‘free’ 40-minute improv still retains something of the form of a shorter structured piece - a song. The inevitable drum solo is never earlier than three quarters of the way in. This is somehow necessary. A conceptual purist would start a clock, say go, play notes at random and, when 40 minutes has elapsed, simply stop the music. Thankfully this never happens. If ‘free’ playing can suggest the form and schedule of composed material it is especially gratifying when you can get more free of that. This is what happens in your second set: warmed up, freer. Here’s a thing about jazz generally. By the second set you’re tired, but you’re energised - it’s almost always better, but no-one knows how - it’s a mystery.